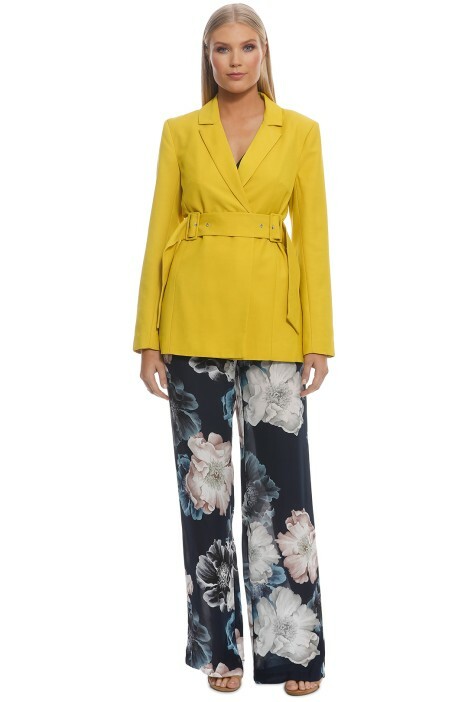 Add some sunshine to gloomy work days with the Silenced Blazer by C/MEO Collective! The yellow blazer has a classic double-breasted silhouette and features a removable double buckle belt. Effortlessly chic and elegant, rent it for an upcoming work function or cocktail party. For a stylish cocktail party outfit, pair the blazer with a white jumpsuit and hire a sequin foldover clutch for added glam. Check out our blog for hairstyle ideas to try for your next cocktail party! Pair this stunning yellow blazer with a chic wide pant or try Navy Floral Palazzo Pant by Nicholas the Label. LENGTH: This jacket is hip length.